The first of the four Navigator Gas ethane/ ethylene midsize vessels, Hull No. 2561, was named Navigator Aurora at Jiangnan Shipyard in Shanghai on the May 3, 2016. Amongst the guests were the Austrian Ambassador to China, Dr. Irene Giner-Reichl (sponsor), accompanied by her husband as well as executives from Borealis and Navigator Gas. The event was witnessed by members from the various companies involved in the supply of equipment or services to this newbuilding, including ABS, LISCR, MAN B&W and Alfa Laval. 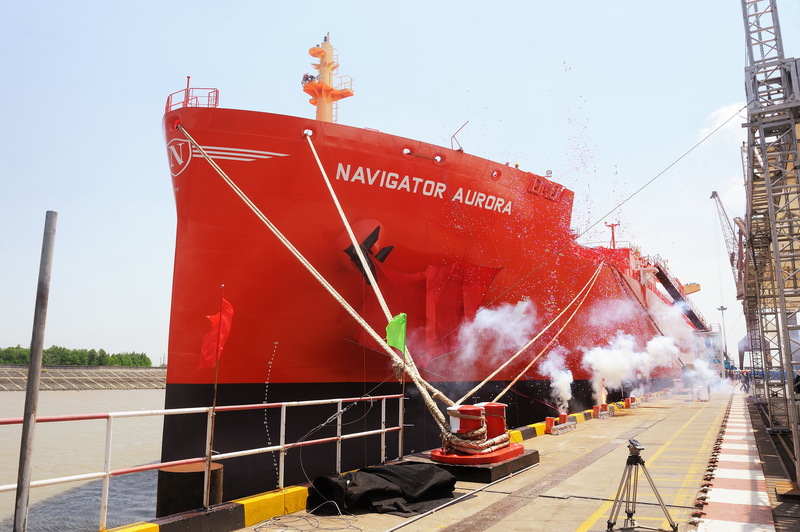 With a length of 180 m, the newly-built vessel Navigator Aurora has a carrying capacity of 37,300 cbm, enabling the vessel to hold up to 20,000 tonnes of ethane/ethylene, making it the largest ethane/ethylene-capable vessel serving the global market. This state of the art vessel has been chartered for a minimum of 10 years to the European chemical group Borealis for the transport of ethane from the U.S. East Coast to Europe. Commercial operations are scheduled to begin in the fourth quarter of 2016 when the vessel will sail between the Marcus Hook refinery in Pennsylvania, U.S. and the Borealis production facilities in Stenungsund, Sweden.